Yorkshire indie band Milburn release their new album - "These Are The Facts" - on 10th September. It'll be their second album. They come from Sheffield (dubbed "The Steel City" as it was the world's biggest steel-producing city during the days of Empire), the same city as the Arctic Monkeys (and even went to the same school as them) but, unlike the Arctics, Milburn haven't had quite the publicity that they deserve.......YET. They also sound very similar to the Arctic Monkeys, and Joe Carnall sings in his distinctive Yorkshire accent just as the Arctics' Alex Turner. Milburn are a four piece band from Sheffield, South Yorkshire. The band consists of Joe Carnall (Lead Vocals and Bass), Louis Carnall (Backing Vocals and Rhythm), Tom Rowley (Lead Guitar), and Joe Green (Drums). Ten years ago, Sheffield, with Pulp’s Jarvis Cocker at the helm, had one of the UK’s most exciting music scenes. In a reflection to those heady days, Sheffield is – but don’t shout it too loudly given the rivalry – proving to be as popular as Leeds. 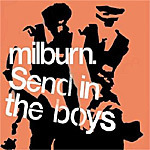 Milburn, who went to school with Arctic Monkeys, invite comparisons with early Blur, Supergrass while they were still singing about having teeth nice and clean, and predictably for any English male four piece with an attitude, The Libertines. In truth, their sound owes more of a debt to The Jam and The Small Faces. Still in their teens, Milburn’s retro tendencies come from their parent’s record collections. During the early years Milburn have developed a strong fan base. Going about things the right way by wanting to create a massive following rather than worrying about being famous. They started out doing local gigs in there hometown of Sheffield, with venues such as The Grapes and The Boardwalk, which is a local venue respected nationwide playing to 350 people every gig. They played a magnificent night at The Cavern(the musical home of the Beatles), Liverpool. The Sheffield Leadmill has also been a great venue for Milburn, having headline there on a few occasions. In the early days their break through gig was when they played to over 600 people at the Nelson Mandela Building at Sheffield/Hallam University, it was also the night where they distributed there demo, Along Comes Mary, which was a 5 track compilation of pure quality. Milburn signed under the record label of Free Construction in Early 2005, and have produced more fantastic music via this label, such as Showroom which was released on the 10 October 2005. After this they went on to do sell out gigs at the London Barfly and a 2000 sell out gig at the London Astoria, which by far surpasses the 600 at the NMB Sheffield. For pure entertainment the band consider the London Barfly gig to be one of their favourite, the gig is so intermate and atmospheric. Check out the download section for “Send in the Boys” live at the Barfly! The biggest news in Milburn’s history to date is when label Free Construction signed a deal with major label Mercury. These Are The Facts is the second album by the Sheffield band. The album is scheduled to be released on 10 September 2007 in the UK on Mercury Records. For a band so young Milburn have the potential to be something truly special. Lets hope they have a similar rise to fame as the AM and that they are both battling out for the number 1 spot! The Sheffield music scene it truly alive and kicking!! Last edited by Blackleaf; Jul 1st, 2007 at 04:06 PM.. The third guy from the left is making this sort of backwards peace sign...I have this on the cd jacket of the soundtrack trainspotting where one of them is flashing this sign outright....it means something in britain i was told but forgot.....anyone? It means "up yours" - it also means that Blackleaf is a shill for any Brit with a press release.